It includes the 2,000+ most beautiful fonts – including many renowned first class font classics of all times and ages for only $19.95. This is must to have font collection for PC and MAC. Thanks to Premium Fonts Collection, you will never miss the appropriate font. This font collection provides a huge variety of type styles for all purposes: classical and modern text fonts, elegant script fonts, impressive headline types and fancy decorative fonts. All fonts come with complete character sets with all accented characters and umlauts needed for the Western European languages. Many fonts also include Central European and Turkish characters. All fonts offer individually designed Euro currency signs and are optimized for beautiful display on the screen and on printers. Premium Font Collection also comes with a font manager for Windows that lets you manage this huge font collection conveniently, prints specimen pages, shows character sets and activates/deactivates groups of fonts with a single click. 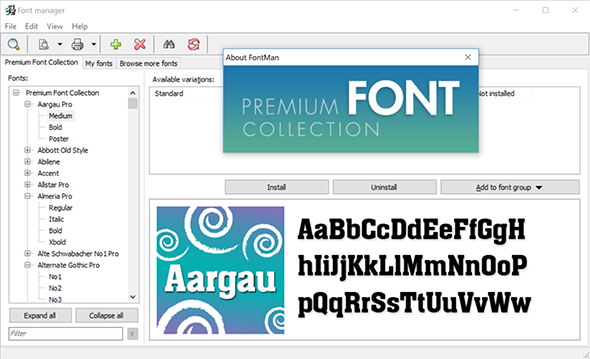 Font manager user interface is available in 23 different languages. Here is a list of all font groups included in this package. Fonts are in a TrueType (.ttf) format. Aargau Pro, Abbott Old Style, Abilene, Accent, Allstar Pro, Almeria Pro, Alte Schwabacher No1 Pro, Alternate Gothic Pro, Altitude Pro, Amber, American Text, Anaconda, Antigone Pro, Antinori, Antiqua Pro, Aquarius, Arizona Pro, Aspen, Auckland, Avignon Pro, Avignon PS Pro, Bank Gothic, Baskerville Nova Pro, Baskerville Old Face Pro, Baskerville Pro, Bay Script Pro, Beacon, Beale Charming. Belfast Serial, Bellboy Pro, Belsize, Benjamin Gothic Pro, Benjamin Pro, Bergamo Pro, Bilbao Pro, Birmingham Pro, Bixby, Bluff No2, Bluff Pro, Boa Script, Bodoni Display Pro, Bodoni Fat Pro, Bodoni Pro, Bodoni Variants, Bombay, Bonita Pro, Book Pro, Book PS Pro, Boss, Boston Pro, Boyle Pro, Bradshaw, Bravo Pro, Bridge, Bristol Pro, Broadway No2, Broadway Pro, Brush Script Pro, Bryce Pro, Campanile, Canossa Pro, Caslon Antique Pro, Caslon Elegant Pro, Caslon Openface, Caslon Pro, Casual Pro, Cathedral Open, Cavalier, Cayenne Pro, Cedar Openface, Century Expanded Pro, Century Old Style Pro, Century PS Pro, Chancery Pro, Chandler Pro, Chatelaine Pro, Cimarron Pro, Clarendon Pro, Clarendon Serial, Colonel Serial, Columbia Serial, Commercial Script No2, Commercial Script Pro, Computer Pro, Congress Serial, Conway Pro, Cooper Black Pro, Copperplate Gothic Pro, Cordoba Pro, Cornered, Courier PS Pro, Cristoforo, Curacao Pro, Curzon Pro, Cycle Pro, Deco Black Pro, Deko Black Serial, Deko Display Serial, Delano Pro, Delaware Pro, Denver Serial, Derringer Serial, Diamante Serial, Digital Serial, Dirty, Disciple Pro, Disco, Dragon Serial, Egyptian Text Pro, Egyptian Wide, Elegant Script Pro, Eller Initials, Elmore Pro, Elmshorn Pro, Energy, Enschede Serial, Entebbe, Estelle, Ewok Pro, Expressa Serial, Falcon Pro, Fette Engschrift Pro, Fette Mittelschrift Pro, Flagstaff, Florence Script Pro, Florentine, Florida Serial, Formula Serial, Fraktur Pro, Fraktur Variants, Francisco Serial, Franklin Gothic Pro, Franklin Original Pro, Fremont Pro, Frenzy, FrontPage Pro, Fuego Pro, Funky, Garamond Nova Pro, Garamond Pro, Garamond Serial, Gascogne Serial, Glasgow Serial, Goudita Serial, Goudy Catalogue Pro, Goudy Handtooled Pro, Goudy Heavyface Pro, Goudy Old Style Pro, Goudy Serial, Granada Serial, Grenoble Serial, Greyhound, Grotesk Pro, Hamburg Serial, Harlekin, Harlem Nights Pro, Harlesden, Harrogate Pro, Hayden Pro, Headlight Pro, Helena Pro, Helium Serial, Hobo No2, Hobo Pro, Hoboken Serial, Hobson Pro, Honeymoon Pro, Horsham Serial, Houston Pro, Huntington Pro, Ingrid, Inverserif, Isonorm Pro, Italian Garamond Pro, Japanette, Josephs Brush Pro, Kaleidoscope Pro, Kalligraphia, Kingston Pro, Klinger Pro, Legend Script, Letter Gothic Pro, Limoges Pro, Lingwood Serial, Litera Serial, Livorno Pro, Looking Glass, Marathon Serial, Marriage Pro, Medoc Pro, Melbourne Serial, Melville Pro, Missouri Pro, Mister Big, Moab Pro, Mobil Graphics Pro, Montreal Serial, Napoli Serial, Neasden, Nicolas Pro, Old Londontown Pro, OnStage Pro, OnStage Serial, Openface No2, Openface Pro, Orator Pro, Organ Grinder, Orkney Pro, Osborne Pro, Otis Pro, Packard, Paladin, Palladio Pro, Pasadena Serial, Pedro Pro, Peoria Pro, Pergamon, Persistent Pro, Philadelphia Pro, Pickering Pro, Pinocchio, Pittsburgh Pro, Placid Pro, Plakette Serial, Pollock Pro, Prescott Pro, Pretoria, Publicity Gothic, Quantico Pro, Quartz, Reflex, Regency Script, Richmond Pro, Rimini Pro, Rochefort Pro, Roman Pro,Roman PS Pro, Rosa, Rough, Rough Script, Rovinj, Rundgotisch No1 Pro. Salmon Pro, Salzburg Serial, Sans Pro, Sans PS Pro. Savannah Pro, Scarsdale, Scott Pro, Scottsdale, Seagull Serial, Sebastian Pro, Senator Pro, Sheffield Pro, Shotgun, Slager, Spokane Pro, Sprint, Stafford Serial, Status, Stencil Pro, Stencil Variants, Sterling Pro, Stratford Serial, Summit Pro, Sunset Pro, Sunset Serial, Sydney Serial, Tabasco, Tampa Pro, Tico, Toledo Serial, Uncial Pro, Unic Pro, Unziale, Varennes Pro, Velo Pro, Violin Script Pro, Visalia Pro, Winona Pro, Woodtype Pro, Zephyr.